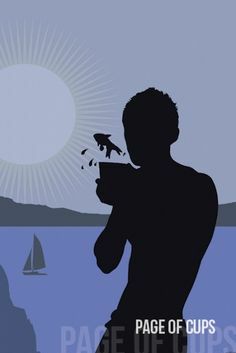 Page of Cups, from Steven Bright’s Spirit Within Tarot. Two weeks ago, my father fell seriously ill. Or, you could say, 20 years ago, he fell seriously ill, when he was first diagnosed with Alzheimer’s. Or, you could say, as the Buddhists do, that the cause of death was birth. When I went home from the hospital that night, I drew a card, finding it hard to believe that this 86-year thread could really be nearing its end. I asked to see what part of his story Dad had entered now. “Page of Cups,” said the cards. “Page of Cups,” I repeated. What could that mean? The real question, of course, was Life? or Death? I reasoned that any card in the deck would lean more towards one or the other. For example, the Sun, Strength, Knight of Wands - all clearly cards of the life force continuing to prevail and radiate at maximum brightness. Death would speak for itself, as would the Hanged Man. And I’d seen the Judgement card indicate the final passage for some. The Page of Cups, I felt, fell squarely in the camp of Death. Cups, of course, are associated with Water in practically every correspondence system. And of the four elements, water is the one most often connected with Death. I could go on further about water, the West, sunset, autumn, and the White Tiger, but for now let’s set that aside. Three zodiac signs are associated with the Page of Cups: Libra, Scorpio, and Sagittarius. 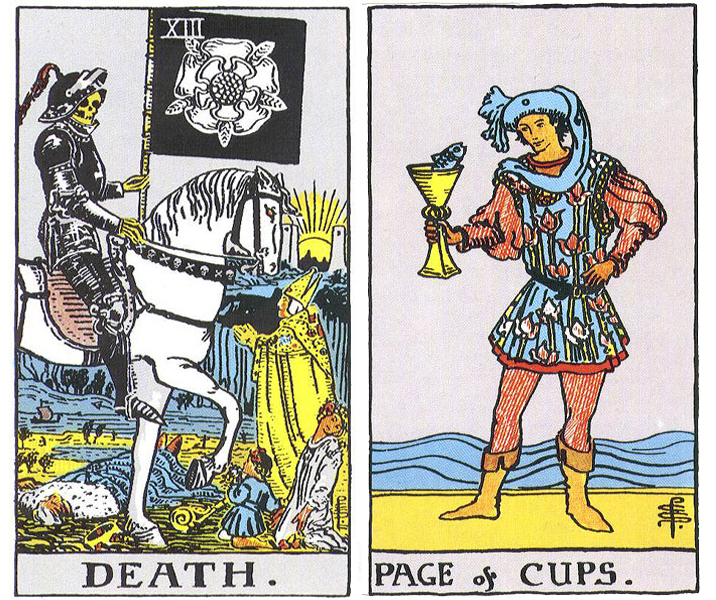 The central one, Scorpio, is associated with the Death card. The path of Death is associated with Hebrew letter נ, nun, meaning “fish”.. And, of course, the one thing we always expect to see in the Page of Cups, whatever deck you use, is: a fish. It’s easy to take the Page of Cups’ fish for granted. But when you think about it, it’s actually pretty odd. First of all, it’s in the cup. What’s it doing in the cup? That’s not its natural habitat. A cup isn’t even a fishbowl. Equally, a fish is not something you drink. There is a real mismatch between the container and the thing inside it, is what I’m saying. Secondly, it’s usually either leaving the cup or poking its head out of the cup. Is that not certain death, for a fish? And finally, the fish and the Page are, most of the time, looking at each other. Also not normal behavior for either the fish, or the human. What is up with that?! The fish represents the unconscious. 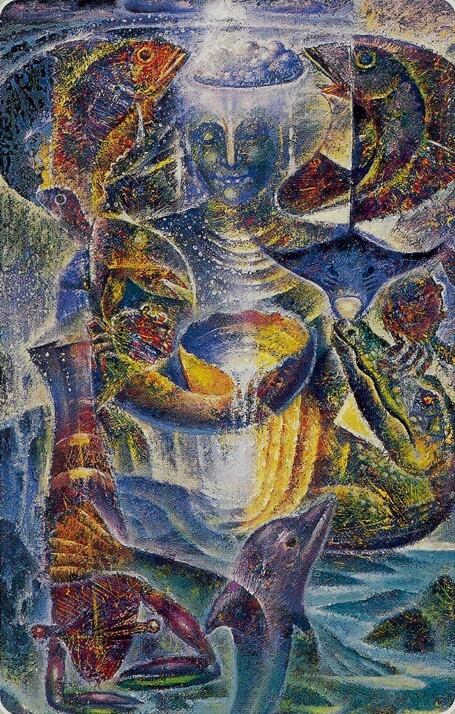 The Page’s awareness of the unconscious is an analogue for the act of dreaming, where for a few hours we have the opportunity to examine the contents of the unconscious, normally buried beneath the surface..Therefore, the Page of Cups represents our capacity to dream; to open ourselves to mystery and the unknown. The wisdom she gains from this experience will in time mature into that of the Queen of Cups, whose compassion comes from recognizing everything one person experiences is universal to all. Furthermore, the Page and the fish see and maybe acknowledge one another because they recognize they are the same - they are both spirits. And so is everything else. This continuity of being, so foreign to our daylight selves, is a fundamental message of the card, the suit, the element etc. The fish represents our mortality. Our human spirit is housed in a temporary and in some ways wildly inappropriate container. In time, we will leave it or it will fail us, and we will return to the sea that is our true home. When we do, it will be a homecoming, and it’s worth the discomfort of jumping out of the Tupperware, or making awkward eye contact with the human who might be able to help. The theme of Scorpio/fixed water you can see in the stream or ocean behind the Page. “Fixed water” is a strange concept, but it’s easy enough to understand when you think about actual bodies of water. A stream is never the same, and always the same; always on the move, and also always right there where you left it. Therefore, although we are mortal and transient, we are also immortal and ever-present. I actually believe that the states of dream and death are very, very close to one another. The idea that they are siblings didn’t just come from Neil Gaiman’s Sandman series (wonderful though that is). The final triptych in the 2000-year-old Orphic Hymns comprises the Hymn to Sleep, the Hymn to Dream, and the Hymn to Death. In the Hymn to Sleep, we greet Lord Hypnos as αυτοκασιγνητος γαρ εφυς Ληθης Θανατου τε, sibling of Lethe (oblivion) and Thanatos (death). In the Hymn to Death, we say σος γαρ υπνος ψυχην θραυει και σωματος ολκον: Your sleep sunders the soul and the hold of the body. I think sleep, dream, and death are more than metaphors for each other. Having watched my father’s dementia for twenty years, I believe that he’s been in a place, devoid of what we normally call ‘sense,’ that is closer to dream than anything else. I believe when he finally crosses that last barrier, the transition from one Dreaming to another will be essentially seamless. I believe the state of dream, where we accept the impossible as given, will prove to have been the rehearsal for accepting that everything is, at last and once again, possible. Page of Cups from Die Wurzeln Asiens tarot. Ψυχαις αεναοις θνητων οδον ηγεμονευειν. Αλλα, μακαρ, πεμποις μυσταις τελος εσθλον επ' εργοις.